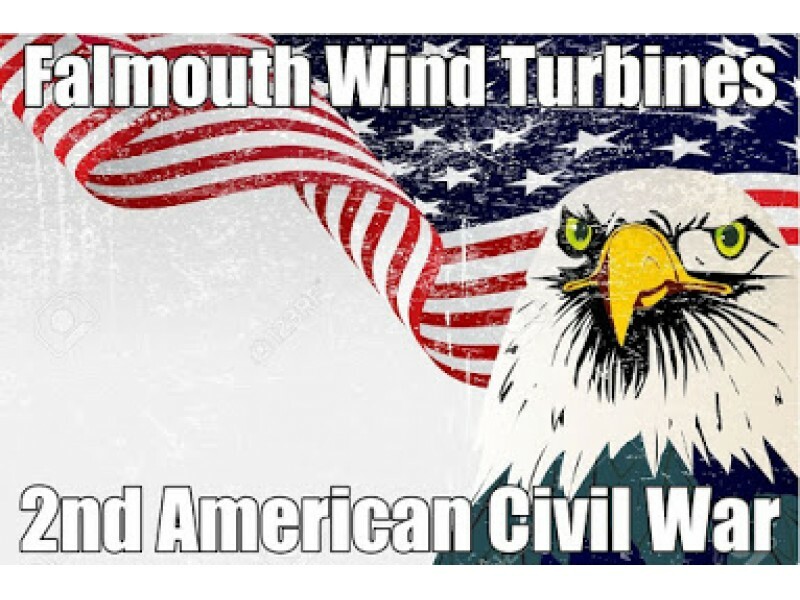 When the Town of Falmouth evicts the wind turbine neighbors and absorbs their properties through an act of eminent domain, those same townspeople will have to open their doors to their own wind power refugees. They may need to be reminded of the hard hearted turning back of the New Orleans Hurricane Katrina refugees as they tried to cross the bridge into the next parish by the Parish Sheriffs. When civility disappears, it can get pretty brutal. Anyone reading this needs to understand that this is the 2nd American Civil War, and it is being fought in many American communities. The sooner the people can come to their senses about the “Falmouth Version of Climate Change BS”, the sooner they will be able to recover from this folly that is destroying them. All this erodes the people’s trust in government, and feeds anarchy. The situation in Falmouth, seized by anarchy, has behaved horribly. The very prospect, the very thought of seizing someone’s home by phony, 50% valuation, eminent domain turns one’s stomach. Some land of the free! While there are many sources of Infra-sound, most of them are generated by passing and sporadic sources, like rockets, aircraft, volcanoes, etc. Wind turbines are permanent installations. They operate at variable speeds. The kinds of noise that they produce is modulated, increases and decreases in intensity, dependent on local wind speeds. They confuse the nervous system and trigger the “fight, flight, freeze response” that all humans have hardwired into our nervous systems. We developed this response to sense the approach of low growling lions and tigers back when we roamed the African savannah in search of food and shelter. This was a MOVING source of noise that we recognized as lethal. Now, the wind turbines, a technological source of lethal noise, while fixed in place, produce (infra-sound and low frequency noise) in a modulated fashion, triggering the FFF response, causing a cascade of alarm hormones; adrenalin to flood the nervous system. This may be adaptive to modern humans; case in point, some imbecile cuts you off in traffic and forces you to suddenly swerve and apply the brakes. You fuss and fume, but you are able to recover from this and continue to drive on normally. When wind turbines sporadically impact on people in their sleep, they are aroused in a state of anxiety, and are unable to get back to sleep. This systematic sleep deprivation far exceeds any methods of interrogation so far devised, and presents these unsuspecting residents with the most exquisite form of torture yet. When they finally seek legal redress they are met by measures of eminent domain to silence them and remove them from the state-driven wind power agenda. Now, Europe as a whole is counting the costs of what is a disaster on a colossal scale. Here’s NoTricksZone detailing the magnitude of the calamity. The video is in German, helpfully translated by Pierre Gosselin. Danke, Pierre. Europe’s € 5.7 TRILLION Climate Policy Is “Very Expensive”, “Counter-Productive” And “Does Nothing For Climate” … “Completely Wasted”! University of Magdeburg economics professor Joachim Weimann held a presentation in Brandenburg highlighting the shortcomings of Germany’s Energiewende (transition to renewable energies) and Europe’s climate policy earlier this year. 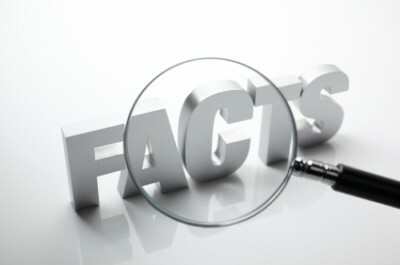 First Weimann calls the climate issue a debate that is emotionally and ideologically charged, and that the facts are almost always suppressed. He also believes that the real facts on climate change and energy policy are unpopular among policymakers and that they all too often “deny” them. In the presentation Weimann makes it clear that he is an alarmist, and that he believes something needs to be done rapidly. The thrust of his presentation, however, is about Germany’s Energiewende and Europe’s climate policies, and whether they are really effective. His assessment in a nutshell: The feed-in acts are a colossal disaster. Weimann says that go-it-alone national CO2 reduction programs aren’t functioning and that emissions trading schemes in combination with energy feed-in acts only result in emissions being sourced out and thus lead to no emissions reductions. In the end the price of emission certificates falls to levels that makes them ineffective. Ironically coal power plants, he says, wind up the ones profiting the most. “Coal is indirectly being subsidized by the feed-in acts,” says Weimann. Everything about coal suddenly becomes cheap, not only its supply, but also the costs of its emissions. For the consumer, however, the price of electricity becomes far more expensive. Weimann also explains that the forced feed-in of renewable energies in fact even leads to greater consumption of resources, and not less. At the 24:20 mark Weimann presents the costs of eliminating 1 tonne of CO2 emissions for a variety of sources: for a coal power plant 1 ton reduction of CO2 costs only 8 euros, for retrofitting a car it costs 100 euros per ton, for onshore wind 150 euros, offshore wind 320 euros and solar 400 euros a ton. This does not include the grid costs. Clearly some CO2 reduction measures make little economic sense. – “It is doing nothing for saving resources”. Next Weimann shows why it is madness to try to replace 18 nuclear power plants (total output 20 GW) with “extremely volatile” wind energy. He says there’s no chance of accomplishing this feat without storage technology, which is still nowhere in sight. Some 437 pump storage facilities would need to be built to ensure the supply of 18 nuclear power plants – an impossible task he says. He calls stopping nuclear energy and coal energy at the same time a pipe dream. More coal burned today than in 1990! Because Germany has already committed to closing its remaining nuclear power plants by 2022, the country will be forced to do 2 things: 1) burn more fossil fuels, and 2) to import more of the unpopular nuclear energy. Moreover, global greenhouse gas emissions climbed 35% from 2000-2012, clearly dwarfing Europe’s 11% reduction. 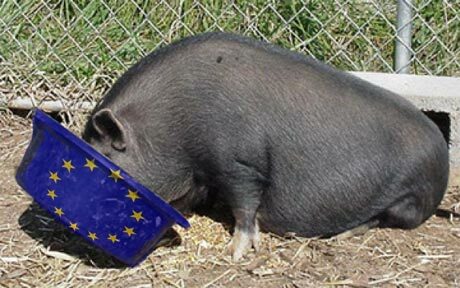 He says the 5.7 trillion euros committed by all of Europe so far will be “completely wasted”. He says that what is needed is an international coalition and that here Germany is doing nothing to support it. The Pope Acts as a Shill for Climate Alarmists. No Regard for the Poor! Outspoken Australian academic publishes telling new book exposing the Vatican for promoting junk science claims about man-global warming. The Encylical Letter of Pope Francis Laudato Si “care for our common home” was influenced by atheists, communists and green activists, claims Professor Ian Plimer, a world-renowned climate critic. In Heaven and Hell Professor Plimer, a successful geologist and long-time critic of climate alarmists, takes Pope Francis to task, looking purely at the science rather than the theology. Plimer shows the failure of the current Pope in his understanding of the real issues causing poverty, especially in Third World countries. Plimer’s is a trusted voice in the heated climate debate and, as in his previous books, his new publication again shows that ‘anthropogenic global warming’ is a dangerous, ruinously expensive fiction, a ‘first-world luxury’ with no basis in scientific fact. “The hypothesis that human activity can create global warming is extraordinary because it is contrary to validated knowledge from solar physics, astronomy, history, archaeology and geology,” says Plimer, and while his thesis is not new, you’re unlikely to have heard it expressed with quite such vigour, certitude or wide-ranging scientific authority. Professor Plimer tells Principia Scientific International that he “hops into Naomi Klein in this book.” (Klein is a trumpeter for the alarmist movement and recently admitted that man-made climate change is not about the science). The book is on general release from October 23, 2015. The Climate Change Authority and the Greens want more renewables because apparently, human emissions of CO2 drive global warming. I am a patient chap, was fabulously good looking in the long ago and have a dog that’s never bitten me but please, dear readers, can someone show me from basic science and mathematics that the human emissions (3% total) of plant food (CO2) drive climate change yet the 97% of natural emissions of CO2 do not. This has never been done and I’m still waiting for the proof. It’s easy to show that human emissions of CO2 don’t drive climate change and there are many scientific arguments to show that the total atmospheric CO2 does not drive climate change. Pope Has Overstepped His Authority….He’s Pushing the Global Warming Agenda! SPECIAL REPORT The VATICAN ADVISORS: An Unholy Alliance with the UN Global Warming Agenda September 2015 In the preparation and promotion of its widely touted encyclical, Laudato Si: On Care for Our Common Home, the Vatican relied on advisors who can only be described as the most extreme elements in the global warming debate. These climate advisors are so far out of the mainstream they even make some of their fellow climate activists cringe. Many of these advisors oppose individual freedom and market economics and stand against traditional family values. The Vatican and Pope Francis did not allow dissent or alternative perspectives to be heard during the creation and promotion of the encyclical. The Vatican only listened to activist voices within the climate movement. Even more startling, many of the Vatican’s key climate advisors have promoted policies directly at odds with Catholic doctrine and beliefs. The proceedings of the Vatican climate workshop included activists like Naomi Oreskes, Peter Wadhams, Hans Joachim Schellnhuber, and UN advisor Jeffrey Sachs. Pope Francis’ advisors, and the UN climate agenda he is aligning himself with, are strong supporters of development restrictions, contraceptives, population control, and abortion. Despite these strange bedfellows, the encyclical is clear in condemning abortion, contraception, and population control. There has been nothing short of an “Unholy Alliance” between the Vatican and promoters of man-made climate fear. The Vatican advisors can only be described as a brew of anti-capitalist, pro-population control advocates who allow no dissent and are way out of the mainstream of even the global warming establishment. Here are profiles of some of the key radical voices with whom the Vatican has associated itself. http://www.climatedepot.com/2015/02/02/pope-francis-apparently-doesnt-know-un-ipcc-climate-objective-contradicts-catholic-doctrine/ http://www.casinapioiv.va/content/accademia/en/publications/extraseries/sustainable.html http://www.climatedepot.com/2012/02/07/read-all-about-it-climate-depots-round-up-of-uns-sustainable-development-efforts/ http://www.climatedepot.com/2014/01/27/gore-fertility-management-is-needed-in-africa-to-help-control-the-proliferation-of-unusual-weather/ http://www.casinapioiv.va/content/accademia/en/publications/extraseries/sustainable.html UN Advisor Jeffrey Sachs Jeffrey Sachs, a special advisor to UN Secretary General Ban Ki-moon, participated in a 2014 Vatican workshop on sustainability as well as in the Vatican summit on climate that took place in April 2015. Sachs was reportedly the author of the Pontifical statement, Climate Change and the Common Good: A Statement of the Problem and the Demand for Transformative Solutions, issued on April 29, 2015. Sachs, who is also the director of The Earth Institute, believes climate skeptics are responsible for the deaths of people due to alleged man-made, global warming driven, extreme storms. Sachs tweeted on November 10, 2014, that “Climate liars like Rupert Murdoch & the Koch Brothers have more & more blood on their hands as climate disasters claim lives across the world.” Sachs is such a devoted salesman for UN “solutions” to global warming that he declared: “We’ve got six months to save the world or we’re all doomed.” Many of Sachs’ views are at odds with Catholic teachings. Catholic activist Liz Yore detailed Sachs’ view on overpopulation. “At a 2007 international lecture, Sachs claimed that ‘we are bursting at the seams.’ The focus of Sachs’ overpopulation mantra is primarily the continent of Africa. He argues that if only poor African countries would just lower their fertility rate, the world and Africa would thrive economically. This fear mongering is nothing new. Sachs is standing on the shoulders of Paul Ehrlich, architect of the ‘sky is falling’ deception perpetrated in his 1968 book, The Population Bomb.” Yore concluded: It is “incomprehensible that the Vatican would be duped into thinking that the United Nations and its Millennium and Sustainable Development goals share common solutions for the world’s problems. The Catholic Church welcomes children as a gift from God. The UN Secretary General and Jeffrey Sachs want to limit children.” 2 http://www.climatedepot.com/2015/02/02/pope-francis-apparently-doesnt-know-un-ipcc-climate-objective-contradicts-catholic-doctrine/ http://www.climatedepot.com/2015/06/20/update-vatican-banned-skeptical-french-scientist-from-climate-summit-they-did-not-want-to-hear-an-off-note/ http://www.climatedepot.com/2015/06/20/update-vatican-banned-skeptical-french-scientist-from-climate-summit-they-did-not-want-to-hear-an-off-note/ 3 In 2009, Sachs addressed the annual conference of the Party of European Socialists. He described the “profound honor” of addressing the far-Left Party of European Socialists and said they were heirs and leaders of the most successful economic and political system in the world — Social Democracy. Social equity, environmental sustainability, and fiscal redistribution are the successful elements in managing a just society, Sachs maintained. This is, he argues, in marked contrast to the U.S., whose taxes are too low and where the poor are ignored. In 2009, in advance of the Copenhagen UN climate meeting, Sachs called for a carbon levy, claiming that millions were suffering because of drought caused by Western-induced climate change. Sachs has advocated for a carbon tax and a financial transactions tax, a global health fund, a global education fund, and a global climate fund. Sachs’ Earth Institute at Columbia has included members of an external advisory board such as George Soros and Rajendra Pachauri (former UN IPCC chairman). Soros has funded Sachs via his Open Society Institute. German climate adviser Hans Joachim Schellnhuber Hans Joachim Schellnhuber, who has called for the “creation of a CO2 budget for every person on the planet,” was appointed a member of the Pontifical Academy of Sciences in June 2015 and was one of the four presenters of Pope Francis’ new encyclical on the environment. Schellnhuber was also a key player at the Vatican climate presentation in 2014. Schellnhuber is an atheist who believes in “Gaia, but not in God.” In 2015, Schellnhuber boasted about having climate skeptics excluded from participating in drafting the Pope’s climate encyclical. The April 2015 Vatican climate summit in Rome banned a skeptical French scientist from attending because the organizers reportedly “did not want to hear an off note” during the summit. Schellnhuber is a scientific activist who is mocked even by his fellow warmist colleagues. See: Warmist Ray Bradley trashes prominent warmist Hans Joachim Schellnhuber for “spouting bullsh*t”; Phil Jones says “We all agree on that.” At a meeting in Japan in 2004, Scientist Tom Wigley found prominent EU warmist Schellnhuber to be “a bit of a laughing stock among these people.” Schellnhuber has also declared human society needs to be managed by an elite group of “wise men.” He referred to this idea as his “master plan” for the “great transformation” of global society. Schellnhuber’s views on population also are at odds with Catholic teachings. Echoing the claims of overpopulation guru Paul Ehrlich, he has claimed that when the Earth reaches nine billion people, which is projected to occur soon, “the Earth will explode” due to resource depletion. Schellnhuber also berates those who disagree with him, calling his critics “vicious liars” and mocking Americans as “climate illiterate” for being skeptics. 4 Naomi Oreskes Climate historian Naomi Oreskes has been actively involved in helping produce the Papal encyclical. Oreskes wrote the introduction to Pope Francis’ book version of the encyclical. See: Papal Encyclical book w/ introduction by Naomi Oreskes. Oreskes is perhaps best known for her calls for placing restrictions on the freedom of speech of global warming skeptics. Oreskes believes climate skeptics who dissent from the UN/Gore climate alarmist point of view should be prosecuted as mobsters for their tobacco lobbyist style tactics. See: Merchants of Smear: Prosecute Skeptics Like Gangsters?! Warmist Naomi Oreskes likes the idea of having climate ‘deniers’ prosecuted under the RICO act (Racketeer Influenced and Corrupt Organizations Act). Critics of Oreskes fired back that it is Oreskes herself – not the skeptics — who uses the tactics of the tobacco lobby. As a researcher, Oreskes’ body of work has not fared well among her peers. She has been criticized by warmist and skeptical scientists alike. See: Statistician from the U. of Mass Amherst performs very polite savaging of claims of Naomi Oreskes. Warmist scientist Tom Wigley wrote that Oreskes’ work is “useless”. Wigley wrote: “Analyses like these by people who don’t know the field are useless. A good example is Naomi Oreskes’ work.” 5 Warmist scientist William M. Connolley slammed Oreskes for “silly” and “shoddy” work. Connolley, a former UN IPCC scientist, wrote that he “eventually concluded that Oreskes was hopelessly wrong.” He explained that a highprofile Oreskes “paper seems to have been written around pre-arranged conclusions…it is unlikely that anyone outside the incestuous field of climate history scholarship will notice or care.” Others have been equally as uncharitable in describing Oreskes’ research. See: Warmist Naomi Oreskes taken down — “consistently misrepresents the meaning of statistical significance and confidence intervals” – “Oreskes, the historian, gets the history wrong” Oreskes has been undeterred, continually ratcheting up climate alarmism to the point of silliness. See: Forget Polar Bears, cats & dogs to die! Warmist Naomi Oreskes prophesizes the climate deaths of puppies and kittens – Oreskes: “The loss of pet cats and dogs garnered particular attention among wealthy Westerners, but what was anomalous in 2023 soon became the new normal.” Sadly, Pope Francis is allowing Oreskes, who equates climate change to a “Nazi atomic bomb,” to write the introduction to the book form of his encyclical. Prof. Peter Wadhams Another key advisor to Pope Francis is Cambridge University Professor Peter Wadhams. Wadhams is a scientist and activist whose views are so extreme that even many of his fellow global warming advocates distance themselves from him. In 2014, NASA’s lead global warming scientist Dr. Gavin Schmidt ridiculed Wadhams for “using graphs with ridiculous projections with no basis in physics.” Wadhams’s fellow warmist colleagues have also piled on and ridiculed him, claiming Wadhams “uses anecdotal…very, very poor data; not credible plots…no physics behind his extrapolations.” One of his colleagues even chided: “Hasn’t Wadhams already predicted four of the last zero ice-free summers?” 6 Wadhams was at the center of international controversy in 2015, when he suggested three global warming scientists were assassinated by the oil industry. These claims were wholly unsubstantiated. See: Cambridge professor Peter Wadhams insists three scientists have been assassinated. Wadhams later tried to claim his comments about the deaths were “completely off the record.” Other colleagues have also criticized Wadhams. See: German Scientists: Former IPCC Author Peter Wadhams Showing Pattern Of Irrationality …”Extremely Far-Fringe Corner” Pope Francis has also reached out to climate activist and anti-capitalist crusader Naomi Klein. See: Pope Francis recruits ‘ferocious critic’ of capitalism — Naomi Klein — in climate battle Klein was brought into the Vatican climate process by one of the Pope’s key aides, Cardinal Peter Turkson, to lead a high-level conference. Klein, described by the Washington Post as a “secular” feminist, is a “ferocious critic” of 21st century capitalism. Klein believes: “To fight climate change we must fight capitalism.” Klein explained: “There is still time to avoid catastrophic warming but not within the rules of capitalism as they are currently constructed.” Klein is author of the book, This Changes Everything: Capitalism vs. The Climate. She has declared that “Capitalism is irreconcilable with a livable climate.” She also noted: “Dealing with the climate crisis will require a completely different economic system.” Klein’s anti-capitalist advocacy clearly places her science as subservient to her politics. During the panel discussion at an event at the People’s Climate March, Klein was asked: “Even if climate change issue did not exist, you would be calling for same structural changes?” Klein responded: “Yeah.” Naomi Klein 7 8 1875 Eye Street NW 5th Floor Washington, DC 20006 http://www.cfact.org http://www.climatedepot.com Greenpeace co-founder Dr. Patrick Moore criticized Pope Francis for sounding like Naomi Klein. Klein has also claimed that “It’s Clear” Climate Change Is Making Racism Worse. A useful idiot is someone who supports one side of a philosophical debate while unaware of the overarching agenda driving the ideology they promote. The term was used during the Cold War to describe communist sympathizers in the West. They were accused of viewing themselves as standing for benign socialism and allies of the Soviet Union, when they were actually scorned by the Soviets who used them as tools to help weaken democratic nations. Climate activists undoubtedly regard many industry leaders as useful idiots on the climate front. Although seriously threatened by the global warming movement, most energy and manufacturing organizations try to appease campaigners by using biased and misleading language that unwittingly supports climate alarmism, destroys jobs, and impairs the well-being of millions. So why would it advocate “a comprehensive legislative solution” to GHG emissions? The CPP will have no discernible impact on climate and yet, according to Chamber President and CEO Thomas J. Donohue, will “impose tens of billions in annual compliance costs, and reduce our nation’s global competitiveness.” That means any carbon dioxide (CO2) reduction plan that might have significant climatic impact would almost certainly destroy the U.S. economy. A “solution that does not harm the economy” undoubtedly does not exist. The Chamber’s contention that the “the problem is international in scope” is true only if climate change is being driven by humanity’s GHG emissions. If it isn’t—and the Chamber should do nothing to promote the idea that it is—then climate change is obviously a regional problem, and each region should adapt to whatever is happening in their area, independent of global trends. The reports of the Nongovernmental International Panel on Climate Change demonstrate that thousands of climate experts dispute the idea that CO2 emissions are a serious problem. UMWA executives are not qualified to judge these scientists wrong, and it clearly sabotages their members’ interests to do so. Duke Energy, the largest electric power company in the United States, says on its website that it is “committed to finding new ways to confront one of our industry’s biggest challenges – global climate change.” While regulations to restrict CO2 emissions present serious challenges to the industry, trends in an imaginary “global” climate have no impact on the sector. While all corporations must follow applicable government regulations, they are under no obligation to encourage them. Considering that a significant fraction of the power Duke generates comes from natural gas and coal, both significant CO2 sources, it makes no sense for the company to urge tighter CO2 controls. While coal is the primary target of the EPA right now, gas will undoubtedly come under increasing attack as the new rules eliminate coal power. Arch Coal, one of the world’s largest coal producers and marketers, also has clear reasons to fear the consequences of the global warming scare. Yet in its August 3 press release Senior Vice President of Strategy and Public Policy Deck Slone said, “To truly address the threat of climate change, these [developing] countries will need low-cost, low-carbon mitigation tools for fossil fuels.” Talk about shooting yourself in the foot. While these groups have obviously decided that it is not in their interests to contest the official excuse for the CPP—the supposed threat of CO2 emissions—it is a serious strategic mistake for them to promote it. Effective leaders know that you can never satisfy those whose ultimate agenda includes eliminating you. Industry must stop acting as useful idiots who feed the fires burning down their homes. Government-Induced Climaphobia….There’s a Reason for it, but it’s NOT the Climate! If you don’t believe in climate change you’re as bad as Hitler. There. I’ve just precised a long article which appeared in the New York Times over the weekend with the title The Next Genocide. Rather worryingly it was the work not of some fruitcake environmental activist but of someone who really ought to know better – a professor of history, at Yale no less, called Timothy Snyder. This is a classic move from the liberal-left playbook. Sock ‘em with an emotive image which lays out the terms of your argument, viz: every time you say you don’t believe in climate change another baby dies. And, oh, by the way, did I also mention it makes you a Nazi? Well, I suppose Professor Snyder has got to find some way of selling his books. Really, though, if he’d tried to write a bestseller called Little Red Cook: How To Diet The Mao Great Famine Way or Back To The Land: Rediscover Your Inner Peasant With Pol Pot orDying for Success: 10 No Nonsense Boardroom Tips from Joseph Stalin he could scarcely have misrepresented history to more dubious ends. Yes, the Nazis were very green. Snyder got that bit right. They passed the first national environmental laws: the Reich Nature Protection Law of 1935. They were big on organic food (Himmler wanted his SS to eat nothing but). They were into animal rights. (In 1933 Goering said that anyone found guilty of animal cruelty or experimentation should be sent to concentration camps. No really). And of course Hitler himself was mostly vegetarian and fiercely anti-smoking. 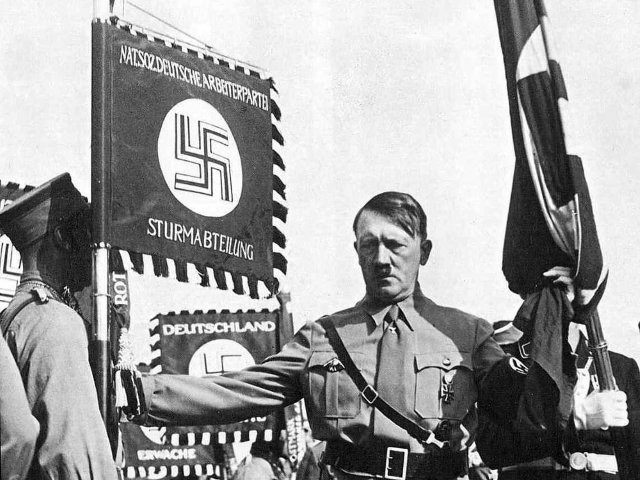 Hitler spread ecological panic by claiming that only land would bring Germany security and by denying the science that promised alternatives to war. By polluting the atmosphere with greenhouse gases, the United States has done more than any other nation to bring about the next ecological panic, yet it is the only country where climate science is still resisted by certain political and business elites. These deniers tend to present the empirical findings of scientists as a conspiracy and question the validity of science — an intellectual stance that is uncomfortably close to Hitler’s. His argument is so weird, incoherent and far-off here that you half expect him to go on to explain how it was the Jews who were responsible for the Holocaust and how Churchill provoked World War II. Certainly, the way he chooses to put “deniers” in the same category as Hitler could scarcely be further off-beam. There’s only one side of this debate which believes its cause is so just and urgent that it relieves them of the need to observe any standards of decency. There’s only one side which thinks it’s OK to: rig public enquiries, hound blameless people out of their jobs, breach Freedom of Information laws, abuse the scientific method, lie, threaten, bribe, cheat, adopt nakedly political positions in taxpayer-funded academic and advisory posts that ought to be strictly neutral, trample on property rights, destroy rainforests, drive up food prices (causing unrest in the Middle East and starvation in the Third World), raise taxes, remove personal freedoms, artificially raise energy prices, featherbed rent-seekers, blight landscapes, deceive voters, twist evidence, force everyone to use expensive, dim light bulbs, frighten schoolchildren, bully adults, increase unemployment, destroy democratic accountability, take control of global governance and impose a New World Order. In other words Professor Snyder, it’s your friends the greens who are the true heirs to Nazism. They’re the ones fomenting the crisis of hysteria which has led to so much bad policy, environmental destruction and human misery. And the good guys – the heirs to the people who stood up to the Nazis – are all those deniers you so casually malign. They’re the ones who’ve checked their facts, rejected Malthusianism and pessimism, who recognise that the best hope for the planet is by harnessing human ingenuity and energy, not by trying to constrain and curtail it. But obviously, you’d need to be a serious historian to be aware of these subtleties.